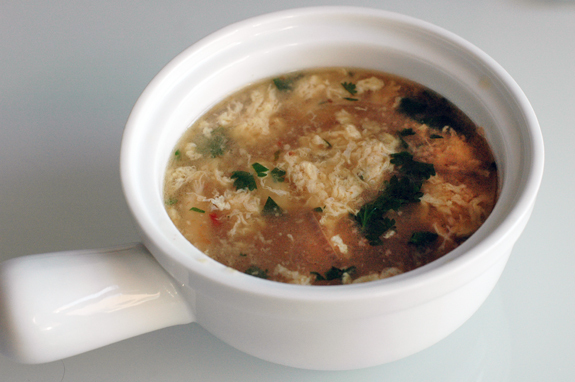 Many moons ago, when I was discovering how to make soups, I did a search for hot and sour soup at David’s request and came across this recipe. He had fallen ill, so I was trying out different soup recipes in an effort to cure what ailed him. It was a hit, so much so that we actually included this recipe in our little recipe book that we handed out as a wedding favor. It’s unfortunate that the only time we seem to break out the soups is when one of us is sick, but as David came down with something yesterday, I decided to revive this long-forgotten recipe. Place broth, onion, ginger and mushrooms in a pot; bring to a boil and simmer for 5 minutes. Add tofu and cook for 1 minute. Stir in fish sauce, lime juice and chili sauce; simmer for 5 minutes. Add shrimp and bring to a boil. Slowly stir in beaten egg with fork. When egg forms threads, remove from heat and add cilantro. David declared it to be the perfect “sick food”–warm, flavorful and quick. It’s definitely a dish that’s out of our normal culinary purview, but it’s good to be adventurous from time to time. I appreciate this dish because it’s easy to make and, unlike many of the other soups we’ve made, doesn’t take hours to boil down. A little bit of prep and 15 minutes of cook time for a thoroughly tasty (and hopefully health-improving) soup.